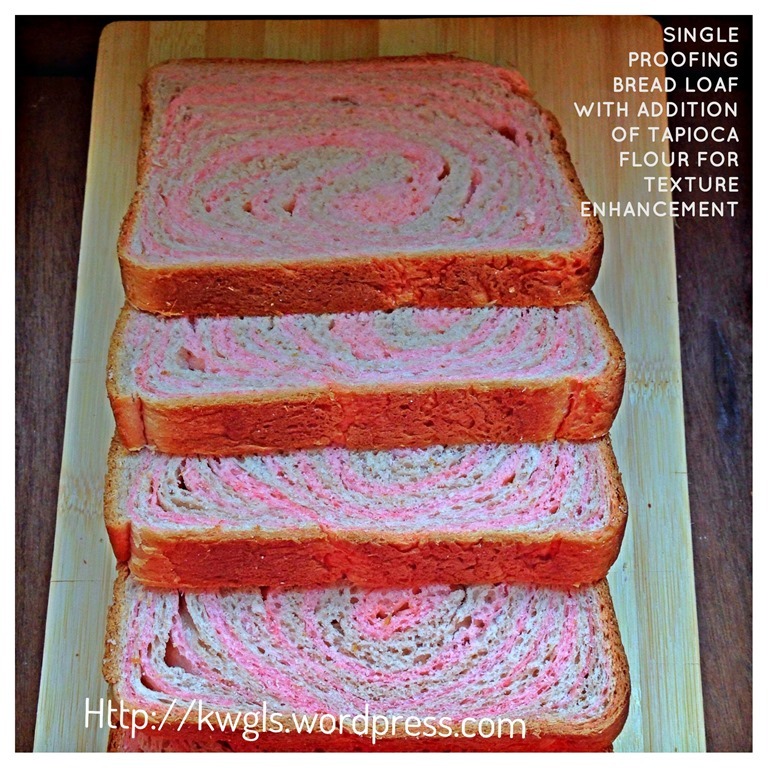 There are two important points in this sharing, one is the replacing part of the bread flour with tapioca flour to enhance the bread texture and the other is the use of single proofing method to cut short the timing of preparation. 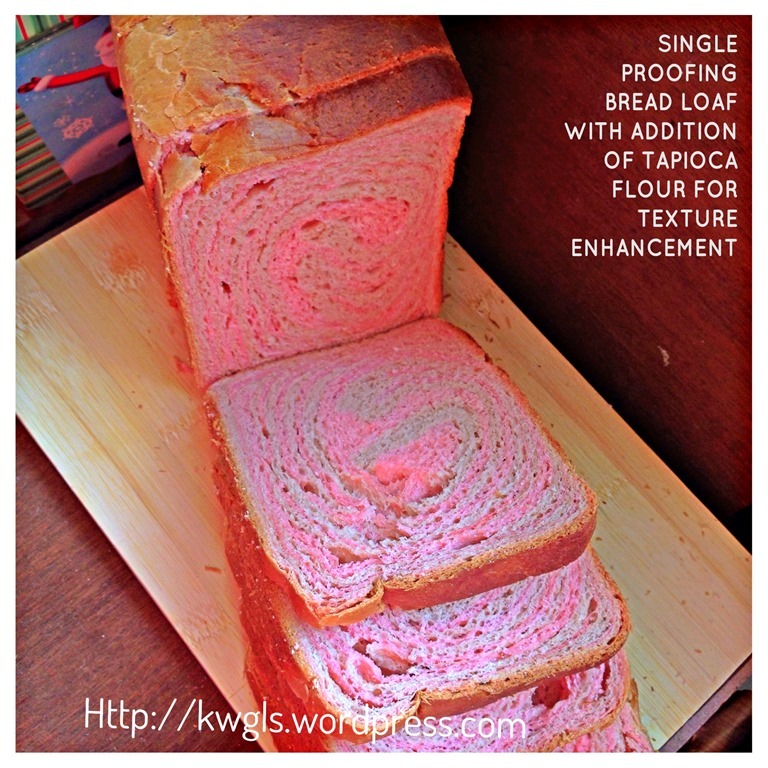 The purpose of the tapioca flour aims to soften the bread texture and enhance the springiness of the bread. 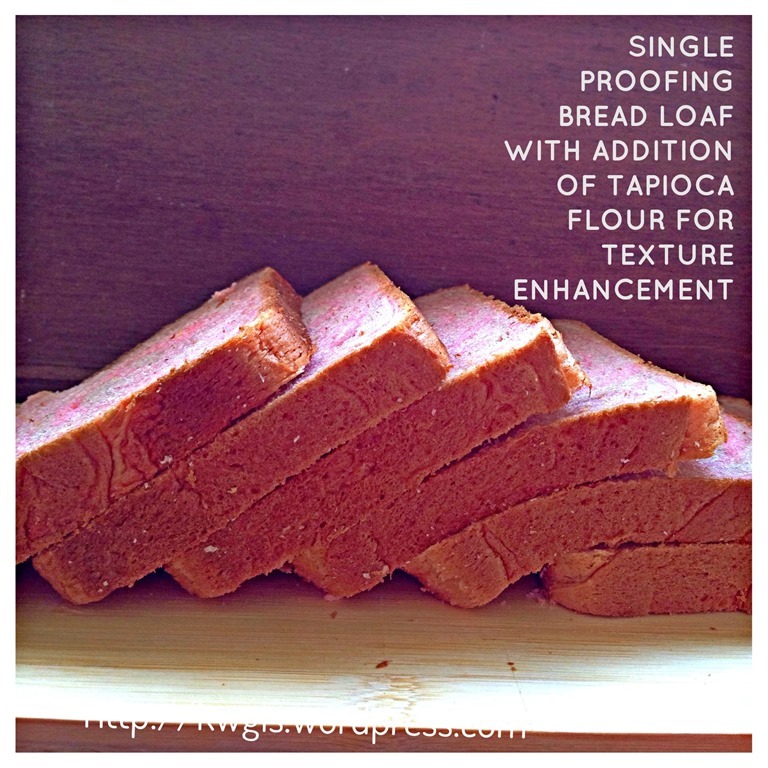 In fact it works well when replacing 30% of the bread flour with tapioca flour. 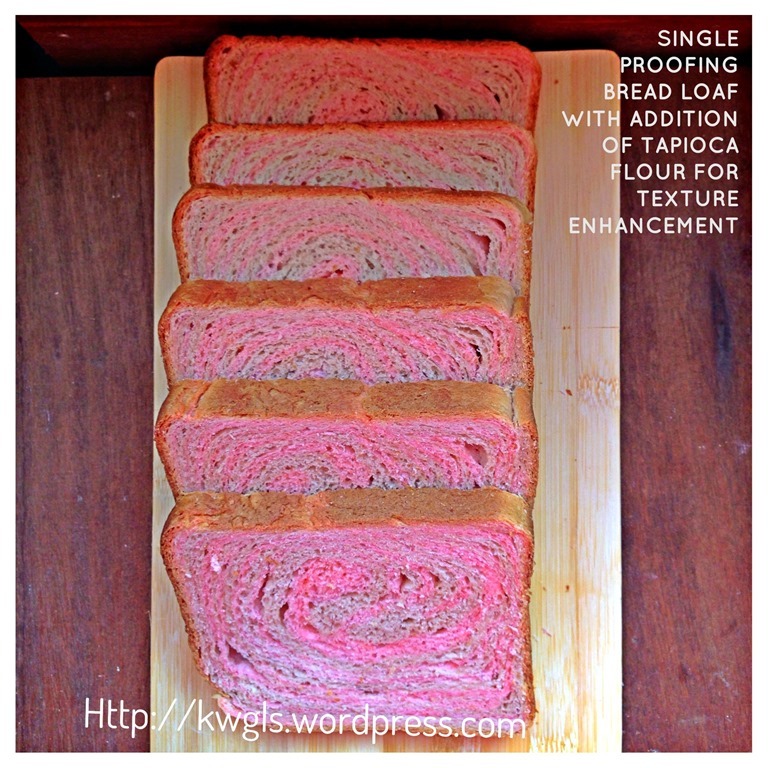 The bread become softer and more spongy. Due to the use of single proofing, you can cut short the timing rather significantly. However, there is a risk of air jackets trapped inside the bread which can be embarrassing. However, for home consumption, I can duly accept this type of embarrassment. The air jackets trapped will be minimized if it is a single colour tone bread (as in this post healthy fruit loaf) rather than dual colour toned bread as in this illustration. Therefore, in the recipe, in order to minimize embarrassing trapped air jackets, I will not share the preparation of dual colour tone . 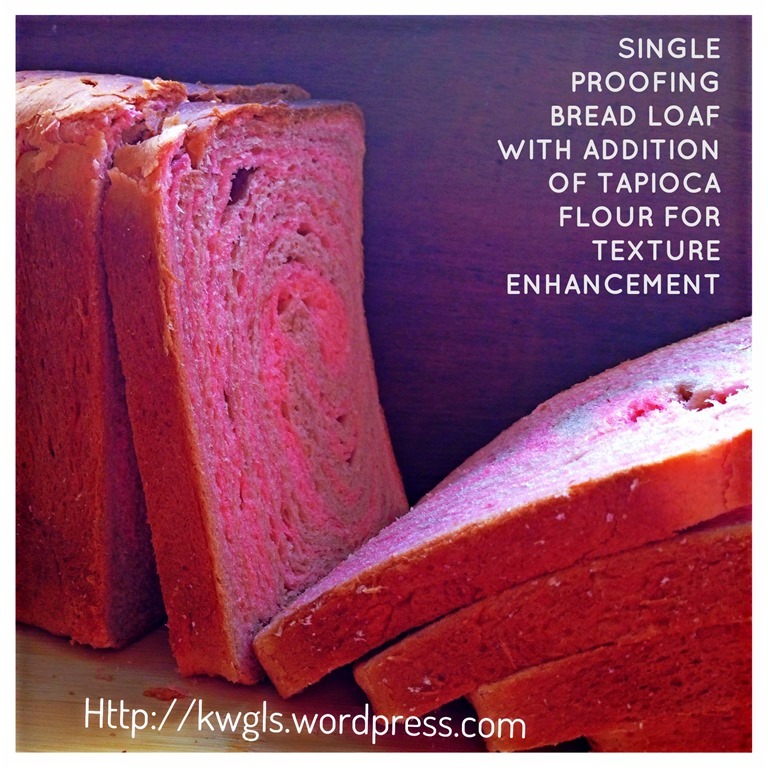 But if you want to see how to prepare in dual colour tone and with dual proofing, you can refer to the post of rainbow loaf here. 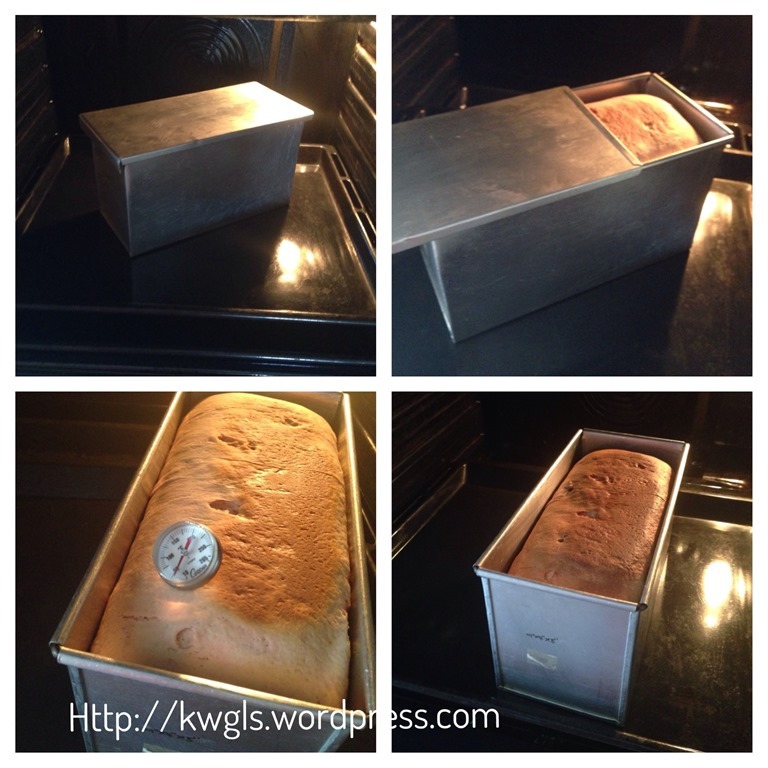 Pre heat the oven to 200 degree Celsius (just before the proofing was done) and lightly grease a loaf tin. In a big bowl, put all the dry ingredients (plain flour, yeast, tapioca flour and salt), make a well and add in the liquid ingredient (milk, and cream). You can either use hand or stand mixer to mix. If you are using a mixer, use slow speed to mix for 2-3 minutes until it form a sticky dough. Thereafter beat at high speed for 15-20 minutes until the dough is not sticky and the wall the mixing bowl is cleaned of any sticky dough. 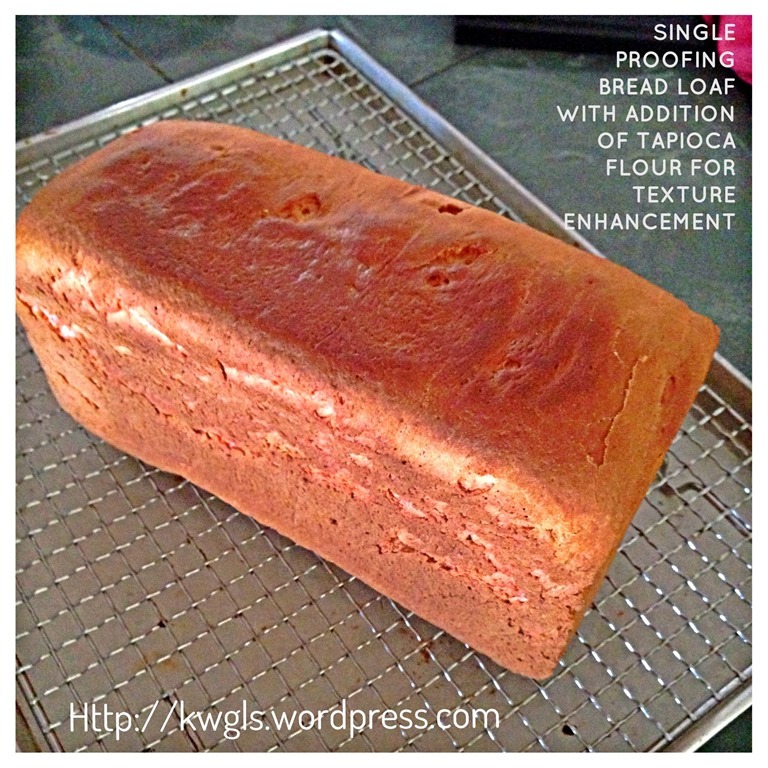 If it refused to form a dough, add plain flour 1 tablespoon by 1 tablespoon until it is smooth. 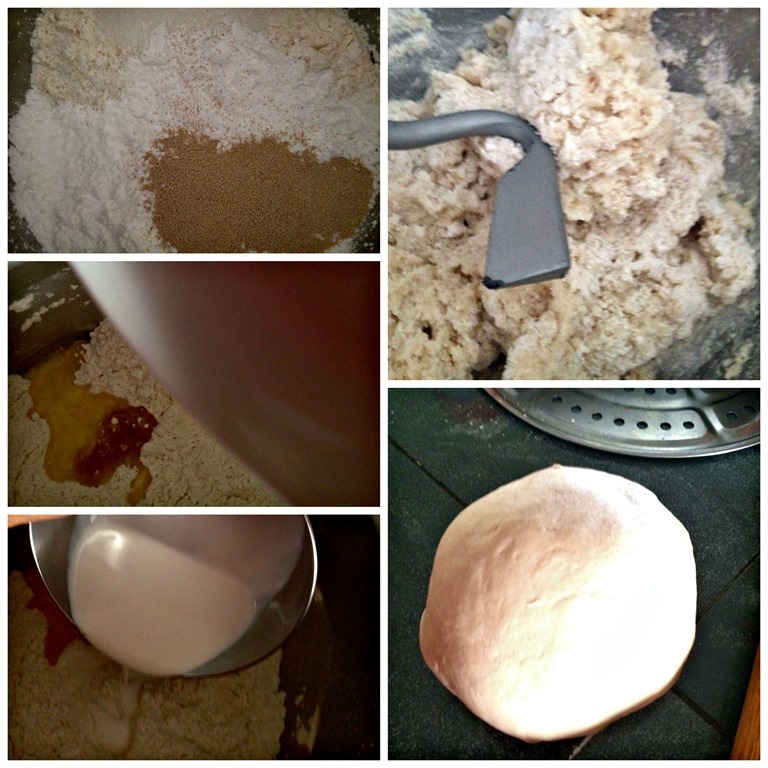 If it is too dry, add 1 tablespoon of water until a dough is form. (All flour have slightly different water absorbing properties, therefore, it is okay to add flour or water during the process and error tolerances are rather high)..Take out the dough and slightly knead until smooth. 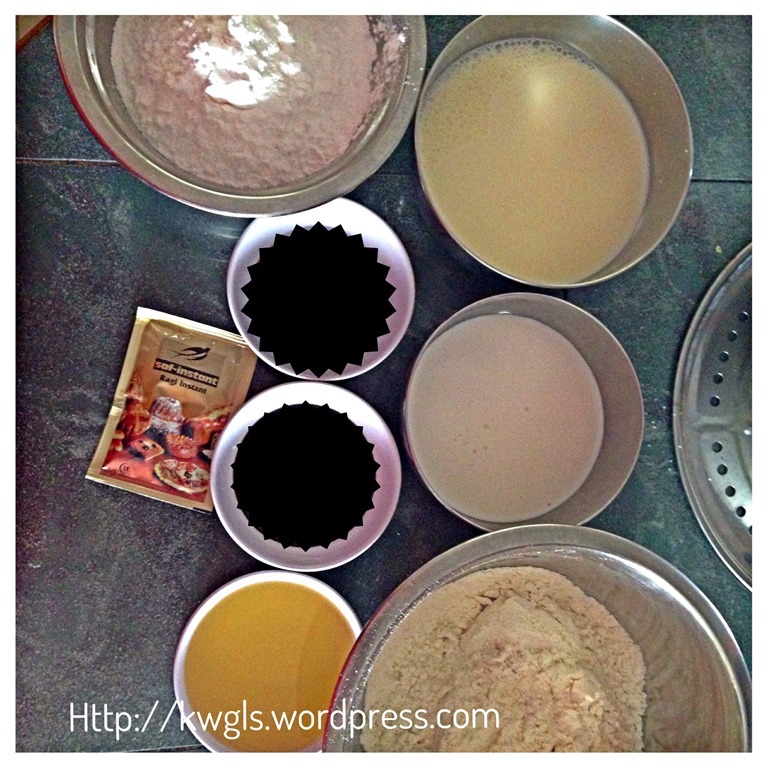 Shape the dough in the shape of the loaf tin. Let it proof in the loaf tin for 45 minutes -1 hour or when the loaf have double in size. Baked in the preheated oven of 200 degree Celsius for at least 45 minutes. At about 35 minutes or when you start to smell the aroma of the bread, use an oven thermometer and insert into the bread and see if the temperature inside the loaf is more than 90 degrees Celsius. If it is less than 90 degrees Celsius, your bread will not be cooked and it is likely that when you take out the thermometer, there will be some wet dough stick to your thermometer. In this case, continue baking until when you inserted again the oven thermometer, the thermometer shows at least 90 degrees Celsius. If you find that the top starts to turn brownish, you can lower the temperature by 10 degree Celsius. General rule of thumb is that if you are unsure, rather bake slightly longer than under cooked. Do give it a try and tell me if you will do this again. My trapped air is rather embarrassing because I am doing it for a dual colour toned bread. However, a single colour toned bread should not have this problem. 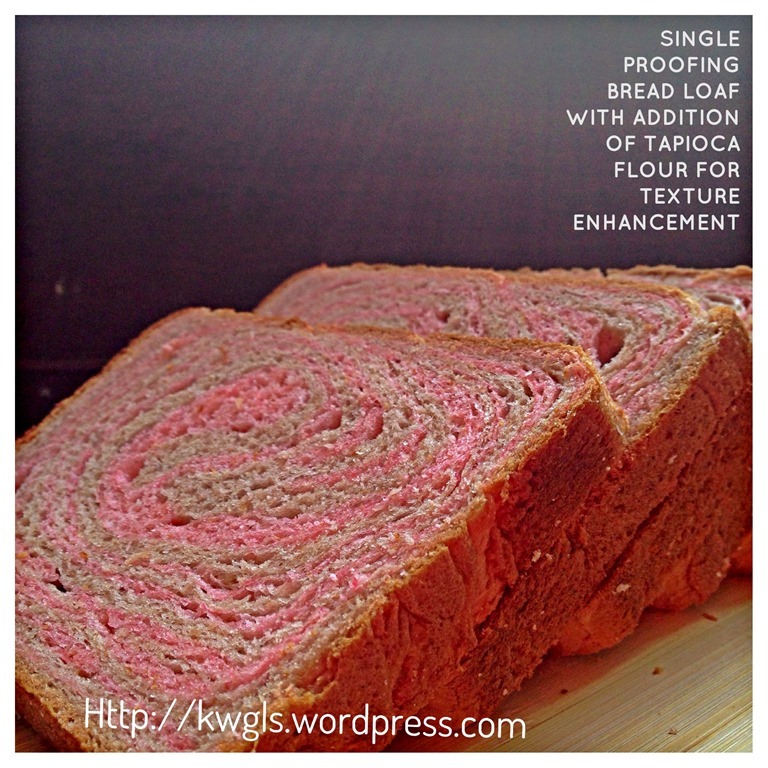 You can see this in my healthy fruit loaf post whereby I have also prepared the loaf using a single colour tone. 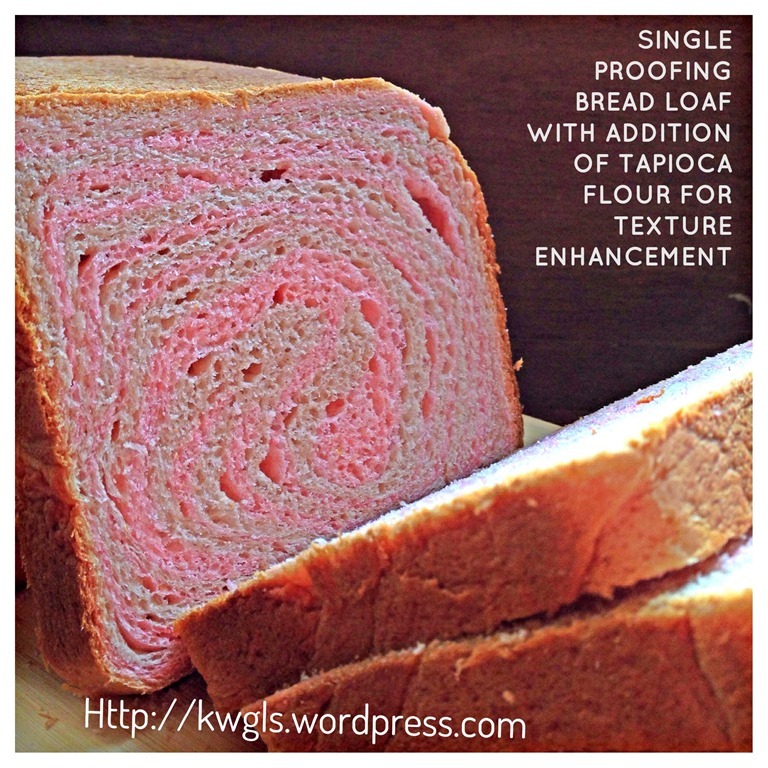 The usage of tapioca flour do enhance the texture of the loaf. 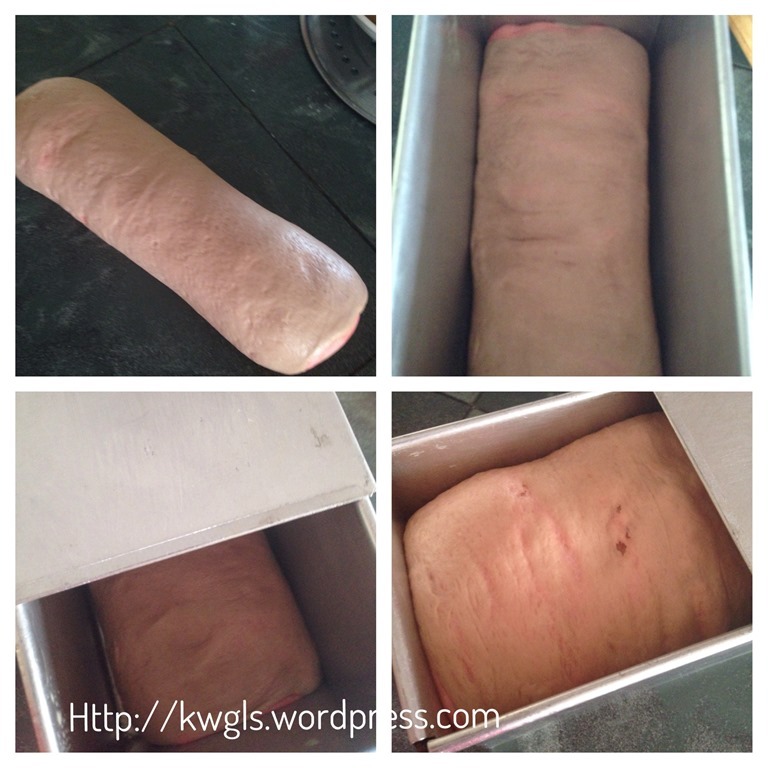 If you want to conserve the moisture, after complete cooling, keep in an airtight container. If it turns slightly hard 1-2 days later (as in most home made bread), re-steamed or reheat in the microwave 1-2 minutes. The bread will be as soft as if it was freshly baked. 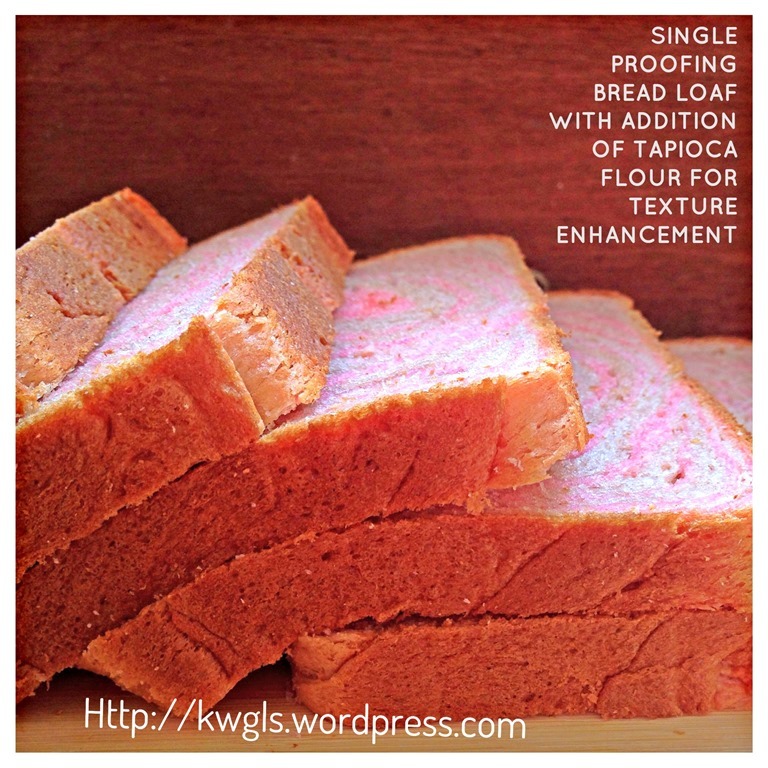 This entry was posted in Breads and Pizza, Food Preparation Series and tagged 8, GUAI SHU SHU, Guaishushu, kenneth goh, postaday, Single proofing, tapioca flour, tapioca flour white loaf. Bookmark the permalink. ← Home Made Sauces, Pickles and Preserved Items . 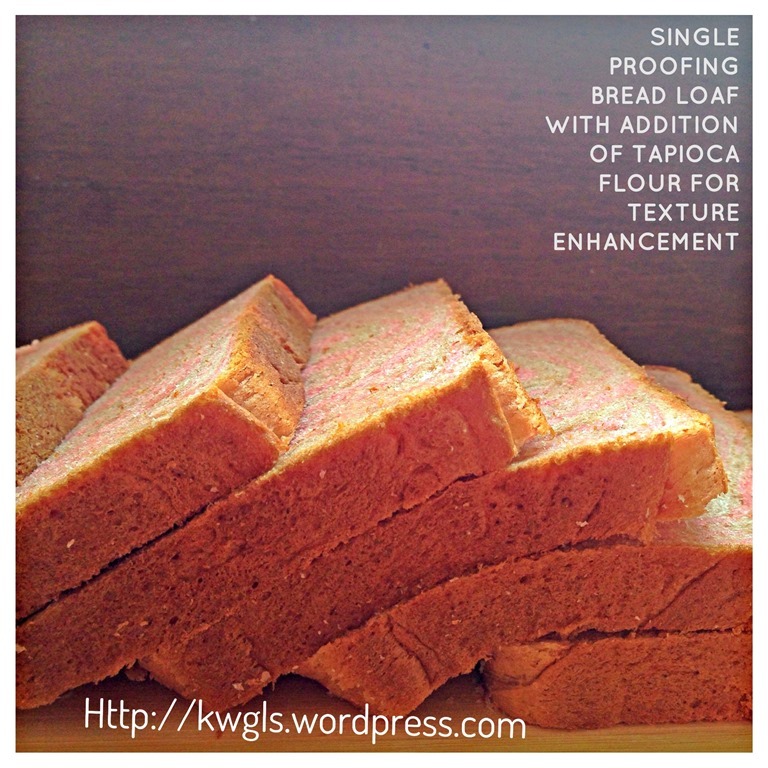 I’ve never heard of using tapioca flour before…I may have to give that a try! Hi, do you think it is possible to replace tapioca with potato starch instead?